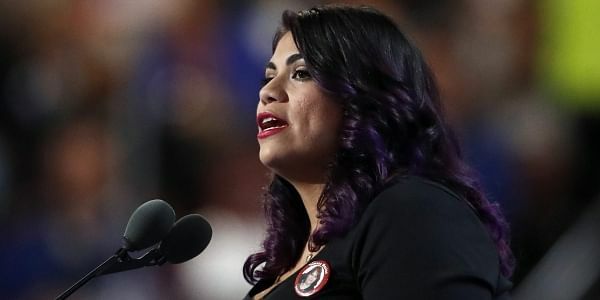 Astrid Silva, who was brought into the U.S. illegally as a child to give a Democratic response to President Trump's address to Congress. WASHINGTON: Democrats are turning to an immigrant brought into the U.S. illegally as a child to give a Democratic response to President Donald Trump's address to Congress. Astrid Silva, 28, said millions of people living in the United States are worried, whether it's about being deported, losing their health insurance coverage or being discriminated against because of their sexual orientation. She made the comments in an interview with The Associated Press on Tuesday at the Capitol. Silva, who will deliver the response in Spanish, said she wants them to know there are people who care about them. And she wants the president to understand his policy choices will affect millions of families around the nation. "It's very important for President Trump to understand that even though he spent so much time campaigning about deporting us, now that he is president, he does have to make these choices," said Silva, a resident of Las Vegas. "He needs to see us as humans. That's what we are. We're families trying to find a better life." Democrats also tapped former Kentucky Gov. Steve Beshear to give the party response. As governor he aggressively expanded access to health insurance coverage through the Affordable Care Act, which Republicans are vowing to repeal. Silva is part of a group of 750,000 immigrants who were brought into the U.S. without authorization as children but later received deportation relief under the Deferred Action for Childhood Arrivals program authorized by former President Barack Obama in 2012. She became pen pals with former Sen. Harry Reid. Obama ended up highlighting her story during an address to the nation about a similar deportation relief program for the parents of children who are American citizens or legal residents. Silva, who was 4 when she was brought to the U.S., said her parents and millions of other families now feel the consequences of Trump's election every day. "My parents are thinking twice about going to the grocery store," she said. "Their friends are calling them and asking them what they do if ICE comes to their door — things that for many years were in the back of our minds but it wasn't necessarily an everyday occurrence." Democratic lawmakers have invited several immigrants to be their guests at the address. In contrast, three people with loved ones killed by someone in the United States illegally will sit near first lady Melania Trump. Despite White House promises that the speech will be an optimistic vision for the country that crosses traditional lines of party and race, Democrats expect to hear little that they will like. But Rep Joe Crowley, D-N.Y., said he doesn't expect any outbursts from Democratic lawmakers in attendance. "As much as we have nothing in common with the president, we do respect the office of the presidency. Keeping that in mind, we will be polite but we will show very little if any enthusiasm at all for what I anticipate his speech will be about." Rep. Maxine Waters, D-Calif., said she'll skip the speech. She said she would have considered attending if the president had apologized for certain actions, citing the mocking of a disabled reporter as an example. "I don't feel good about it, so I won't be here," Waters said. Others are taking different paths to show their displeasure. Rep. Eliot Engel, D-N.Y., announced he would not try to shake hands with the president as he customarily does. Many lawmakers arrive hours early to position themselves for an aisle seat so they can greet the president. Dozens of female lawmakers were wearing white on Tuesday in honor of women's suffrage. "Know that we stand committed and ready to fight on behalf of all women and girls," said Rep. Julia Brownley, D-Calif.